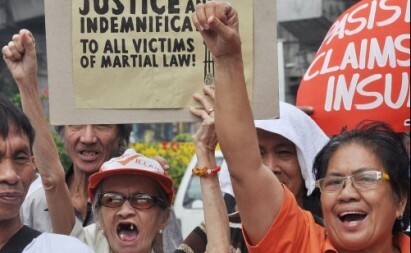 MANILA, Philippines – Militant organizations chorused against the continued trampling of human rights, curtailment of rights to express and organize, and the killing of perceived state enemies, including indigenous peoples, as the nation marked the 43rd anniversary of Martial Law. File photograph by Lester Lopez. Kabataan partylist Representative Terry Ridon said a “new age of terror” was ushered in under the administration of President Benigno Aquino III. “Malacañang wants us to believe that the terror wrought by the Martial Law era is now a relic from the past. Yet activists, government critics, and indigenous leaders all know and experience state terrorism until this very day,” Ridon said. Recently, several progressive groups, including Kabataan Partylist, sought relief at the Supreme Court following a revelation by the Makabayan bloc of lawmakers that the Armed Forces of the Philippines (AFP) has a “hit list” that targets known progressives, Lumad leaders, and critics of the government. “We must never allow the return of the US-backed, open fascist dictatorship. It is true that we need to remind the current and future generations of this dark period of history. However, it seems that it is the Aquino government that has not learned any of the lessons of the past, as it continues to repeat the crimes of the dictator,” Bayan chairperson Carol Araullo said. “The Aquino regime likes to tout itself as the opposite of the Marcos regime, but rights victims are saying otherwise. There are now more than 500 political prisoners under Aquino, more than the political prisoners under the Arroyo regime,” Araullo added. Ilagan also denounced the recent spate of killings in indigenous people communities, especially at lumad areas of Mindanao. “The continuing military harassment of indigenous communities in Mindanao echoes the brutality of the Marcos counter-insurgency tactics. Civilians, activists and human rights defenders are branded as rebels by the military and its vigilante death squads,” she said. “The killings are just as brutal, and illegal arrests continue. There is very little difference between what happened four decades ago and now. Aquino has not declared Martial Law but it is very much felt,” Ilagan added. The Kilusang Mayo Uno said that workers and unions did not get any reprieve from the Aquino administration, who continue to be barred from forming unions. The Center for Trade Union and Human Rights (CTUHR) said that there have been at least 43 cases of union busting since Aquino became president. Workers face illegal dismissal and other forms of repression when they try to form genuine pro-worker unions, it said. The group Anakpawis decried the trumped up charges and red baiting tactics against progressives, including its leader and former partylist Representative Rafael Mariano. In a separate development, Senator Bam Aquino urged the nation to continue retelling the stories of Martial Law, saying “the sacrifices, atrocities and heroism during the darkest years in our country’s history should not be forgotten and must be imparted to today’s generation”. Aside from that, Sen. Aquino said, the Presidential Commission on Good Government (PCGG) estimated that the country’s coffers lost around $10 billion during Marcos’ reign. The senator also called on the youth to not be easily swayed and misled by stories being disseminated online, saying they must examine their veracity and truthfulness. The senator’s uncle, Ninoy Aquino, was among those arrested, imprisoned and tortured during the Martial Law. Ninoy was tagged as Prisoner No. 1 as he was arrested moments after Martial Law was declared.